After the odd delay, the most desired speed video game in recent times approaches the grid. We have already been able to ride around the circuit Project Cars and impressions left us have been spectacular. Nor is it necessary to be clairvoyant to predict the most likely mega success will mean Project Cars, at least within its specialty. This is the famous simulator speed has been sponsored by a huge community of players around the world and will be signed by the prestigious team of Slightly Mad, responsible among other formidable Need for Speed: SHIFT. Few dates ago we had the opportunity to take a few games to a virtually complete-Delivery to PS4 and also to a stunning edition for PC monitors compatible with 12K and one with compatibility with version Oculus . The experience was unforgettable! We don’t usually start talking about any title from the technical side, but in this case we will make an exception because we have no choice. Project Cars will be one of those games that enter through the eyes and that surely will become the new standard of the genre in graphic matter as it goes on sale. At least, we insist on the PC version, which left us really overwhelmed, although the issue for PS4 not be left behind. The most powerful edition we tried was the one we mentioned a moment ago, that is, which was mounted on three monitors in 12K more wheel and pedals built format, although for technical reasons, the beta was "limited" to 30 fps instead of the 60 that reached the final version. 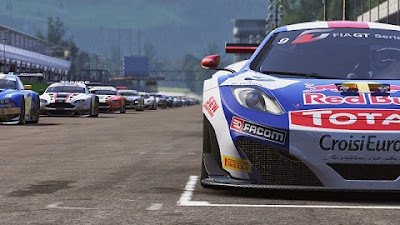 And we guarantee that the sensations transmitted Project Cars we were incredibly positive, one of the games most impressive and realistic speed we have had occasion to try. The strength showing its tracks, which incidentally were counted by tens (be the world's best known, although for reasons of foreclosures rather not get into that moment) was only comparable to the level of detail that showed all of them, really flawless. But they took palm sports cars and it will be possible to drive. Mercedes, Audi, Lotus, and many other manufacturers Pagani Top (although we missed some of them, especially Italians) give their best models, so we could check and enjoy impeccable modeling both outside ... and interior. Indeed, in this case the Oculus technology allowed us to see the detail that will be conducted every car interiors that appear in the game. This technology certainly enjoyed an impressive sense of immersion and a good overall finish, although the definition was not similar to that shown in 12K edition and also somewhat "dizzying". Following the technological side, we don’t want to mention the stunning quality showing precipitation. The interpretation of the effect of rain left us with wide eyes, one of the most realistic and gimmicks we've seen in any driving title. We already say what you think when you try yourself. Something similar happened with very elaborate general lighting with dynamic light effects and reflections recreated in great detail. If I still had any doubts user about the type of gameplay that offer this title, once stuck in fatigues and with regard merely driving feel we can ensure that this title is a simulator above anything else. The precision must be demonstrated at the wheel for victories will be highlighted, which will surely excite scholars specialty. Despite this, it is also true that the game will allow us to calibrate a wide range of aids and driving parameters to adapt to any type of player, whether expert or novice in such productions. The title will be an outstanding, very realistic simulator, and I anticipate it may be one of the new leaders of the genre. During the demo we were able to lead relatively normal cars from karts, cars and "beasts" highly competitive displacement, and differences in stability, top speed, handling and other characteristics were considerable. Similarly, the sense of speed that gave off the game was more than adequate, especially since the numerous interior shots from which we can continue racing. We were also struck by the huge number of configurable options series that will bring the game (rules, extension, conditions, number of participants, starting position, weather, difficulty, etc.) and game modes. Unfortunately we cannot speak virtually none of the latter for reasons ... yes, foreclosure, but I will notify you by what we have seen Project Cars will be one of those games that will squeeze its fans for months, something which otherwise usual in the best representatives of the genre. Project Cars has every chance to become an exceptional driving simulator on all platforms for which it appears, imposing special edition PC which both we have spoken in this development.